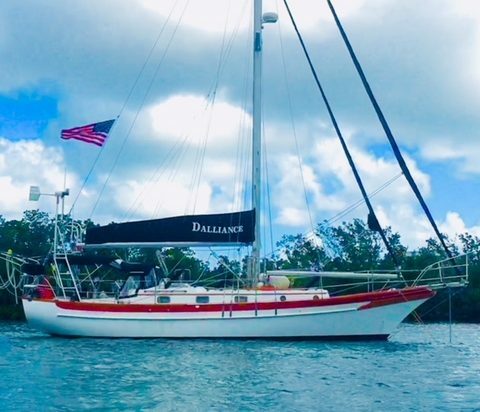 Dalliance is a 1987 Cabo Rico 38 with a large main salon, king size V berth forward, and quarter berth aft. She is cutter rigged and ready to go cruising with many custom features including 85 gal water capacity with water maker, AC, and 2003 Yanmar engine. Her two 55 gallon fiberglass diesel tanks are great for extended range. The main salon is larger than standard, with a bulkhead mounted table to provide a full double berth on starboard and single to port. Dalliance is one the best, well built cruising boats in her class. Her teak cockpit was removed and re glassed by Brewers Boat Yard in 2010.